Use sessions and delegate classes to define permissions at the record and field level. Xataface 0.6 adds a new, fine-grained permissions model and support for user authentication using your own database tables. This section includes a brief overview of the permissions framework and a small example of how you might use permissions in the FacultyOfWidgetry application. view - The user has permission to view the content of the page for a particular record or table. edit - The user has permission to edit a record. delete - The user has permission to delete a record. add new related record - The user has permission to add a new record to a relationship. 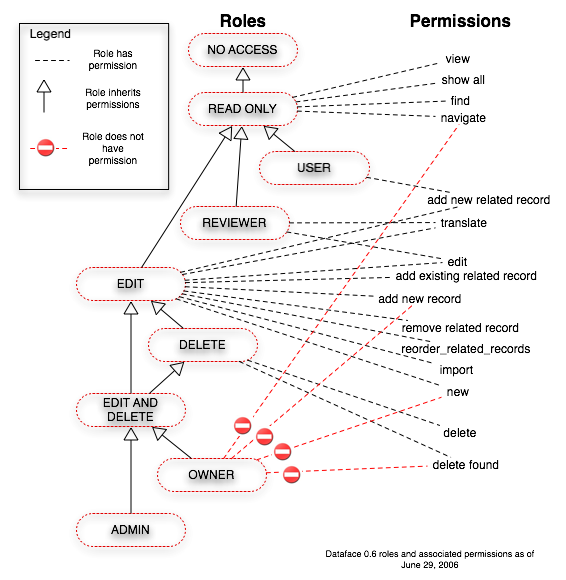 Before allowing the user to perform an action, Xataface checks the permissions to see if the user has the appropriate permissions. You can override the default permissions by defining a method called 'getPermissions()' in your delegate classes (more on that below). There could be 50 or more permissions associated with an application, so it quickly becomes unfeasible to have configure each user's access on a permission-by-permission basis. Roles provide a means of grouping permissions together into logical sets so that each user can be assigned a role, which has a set of permissions already associated with it. People can drive the car. People can ride in the car. People can wash the car. People can fix the car. The owner role should be able to do everything except for fix the car. The mechanic role should be able to fix the car, but not drive the car. The friend role should be able to ride in the car and wash the car, but not drive or fix it. And the thief should not be permitted to perform any of the functions. Role does not have any permissions. This role can view, show all, find, and navigate - which boils down to: this role can look but not touch. This role can do everything that READ ONLY can do plus edit existing records, add and remove related records, import records, and translate records. In essence, this role can look, and touch - but not necessarily delete. Can do everything that EDIT can do, plus it can delete records. Same access as DELETE, but by a more intuitive name. In theory OWNER may have different permissions than DELETE if actions were introduced that made sense for the OWNER role but not the DELETE role. Includes all of READ ONLY's permissions, but also has the ability to create new records. Users have to log into the system to access it. Add a "Users" table to store the user names, passwords, and user levels of the system users. Turn on authentication in the conf.ini file. Define permissions for each table in our application using delegate classes. NO ACCESS - Not allowed to access the site at all. READ ONLY - Can view the site, but not edit anything. ADMIN - Has full access to the site - can add and edit programs and courses.
. This is just one way to implement permissions. There are many ways that you can do it. The reason we have a UserID field in addition to a UserName field is so that we can change the UserName without destroying relationships. (It is important to note that you can use any table to store your user information, as long as it has a field for the user name and password used to log in). The 'users_table' directive indicates the name of the table that stores the users for the application. The 'username_column' is the name of the column of the users table that contains the login user name. The 'password_column' is (obviously) the name of the password column of the users table. There are some other directives that can be added to this section to customize the login scenario, but these 3 basic ones will get us started. * some functions such as permissions and preferences. * performed to make sure that the user has permission to perform the action. // if the user is null then nobody is logged in... no access. // This will force a login prompt. // Returns all of the permissions for the user's current role. Notice that the "Edit" tab is no longer visible - only the "View" tab. If we log out and then log back in as 'adminUser', the edit tab re-appears along with options to create new records and delete records. (Note: These PHP sources are out of date, and include deprecated code such as short open tags. You will need to change all PHP open tags from "<?" to "<?php" in order for these samples to work in most modern PHP installations). This section gives you a basic understanding of Dataface's permissions and authentication model. You should now be able to add authentication and permissions to your dataface applications. Some more advanced features, such as creating your own roles and permissions will be covered in later tutorials and reference manuals. Later sections will also look at custom actions which can use the permissions model to limit who can perform them.